Merely hold the Magic Square while you’re selecting numbers and the correct numbers may begin to emerge from your subconscious mind. 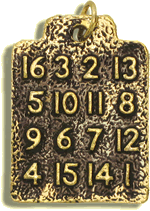 The Magic Square may be particularly useful in games of chance, such as the lottery. Ordering the Magic Square today could turn your hard luck into good luck. Plated in 14-karat gold, the Magic Square can be worn or carried. I was at home relaxing and a friend called to say that he wanted to go to the new casino in Arudel, Maryland. I decided to go and during the time I was there, I was wearing the Magic Square amulet around my neck. I touched it and something made me play a slot machine I really didn’t like, but played it anyway. I won a jackpot in the amount of $2,515 from that very slot machine. I nearly fainted! I have never won a jackpot in my life! I knew immediately what had taken place. Thank you. I will definitely continue to use your amulets and spells when I need them. YOU ARE FANTASTIC! I just purchased the Magic Square and received it on 07/02/2011. I took it with me when I purchased 10 lotto tickets on Monday the 4th. On Wednesday the 6th I hit 5/6 numbers on the lotto. I went up to the lotto office and picked up $677.00. Then purchased 2 scratch of tickets and won $45.00 on the 1st ticket and $25.00 on the 2nd ticket…This charm really works, at least for me it does… Let’s hope on the 9th I get 6/6 number with the tickets I purchased on 07/07/2011! Thank You! I bought the Magic Square for my mother and the first night she received it she won $150 at bingo then bought a lottery ticket next day and won $100 then just the other night she kept winning small amounts at bingo. It may be small amounts but it is extra money she did not have, WE thank you for the LUCKY Square! I find this interesting. Life is about # and the stars, location, mind set. You bring good luck to yourself, your mind. Put the energy out their into the world, if you’re always positive good things happen. Negativity brings trouble. Love this.